clothing line, and musical entertainment by the Gentle Folk Barbershop Quartet. The fee to attend a luncheon is $20 and an additional charge for a cash bar. Leawood Mayor Peggy Dunn tries to attend as many of the luncheons as her schedule allows, says Murphy. 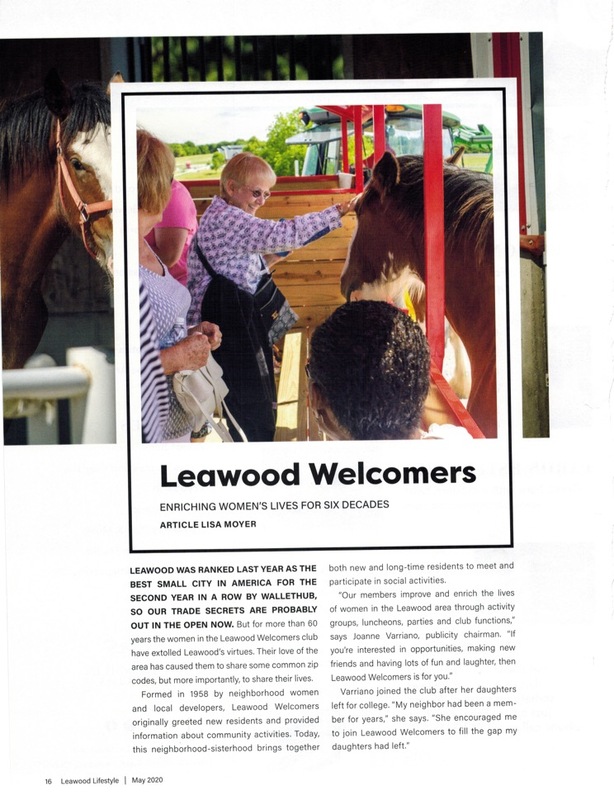 According to Murphy, the Leawood Welcomers club meets the social needs of women who want to get out and enjoy the traditions of a women’s organization in their community. The club often tries to “mix things up” with old favorites. For example, during a recent movie night, the group decided to see an earlier movie and then head to a local restaurant for happy hour. A recent hospitality coffee was changed to a spring tea and encouraged members to “get all dolled-up” with a “sassy hat and gloves, or even high heels” to celebrate the warmth of the season. The spring tea also featured a handwriting expert who discussed why we slant certain letters and add flair and swirls to others. Its book review club meets at Yia Yia’s in Leawood to discuss the book of the month. Recent book reviews included Skeletons at the Feast, by Chris Bohjalian, Light on Snow, by Anita Shreve and The Glass Castle, by Jeanette Walls. In May, the Leawood Welcomers gathered its members for a trip to Union Station to see the Princess Diana exhibit. While meeting in area restaurants and country clubs is a fun part of the organization, Murphy says members often enjoy and opt to entertain in their homes for such things as bridge, canasta and other activities. Beyond the social aspect, members oversee a caring and sharing committee designed to offer support and prayers for members and their families. The group also participates in certain civic endeavors as well. Some of the ladies recently volunteered to staff the Kansas City Symphony’s Designer Showcase. 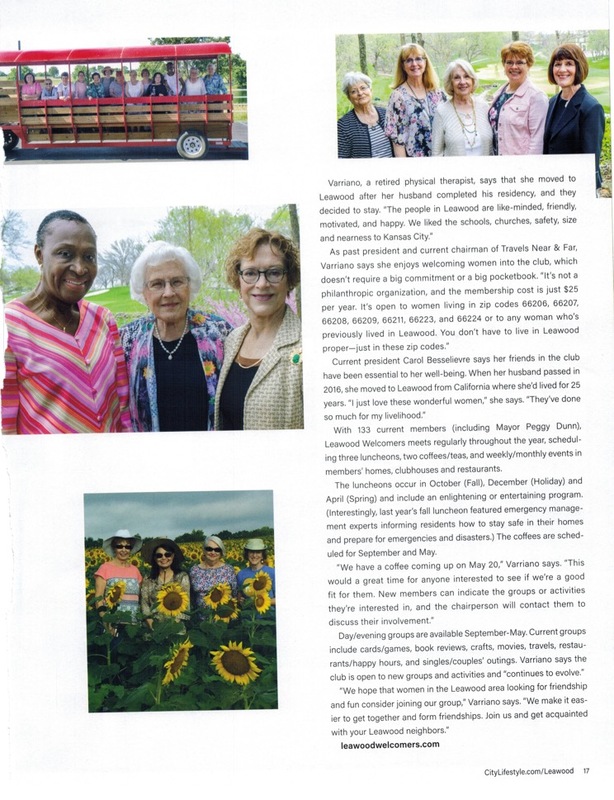 Many members also donate their time and talents at local hospitals, Starlight Theatre, and various other civic, political and charitable events. The organization’s goal is to have its members make friends through social activities. Through their interaction, they strengthen neighborhoods and the Leawood community, says Murphy.